As a young adult I read everything Jeanette Oke wrote. I still have all my books, and now my daughter is devouring them. A special favorite of ours is her Canadian West Series. 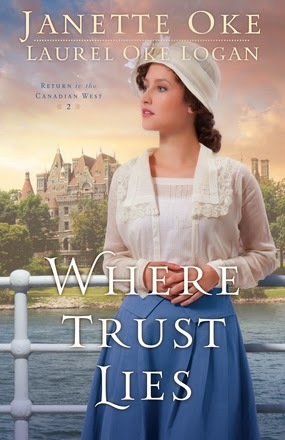 This book, "Where Trust Lies" is co-written with her daughter Laurel Oke Logan, and is a book 2 of Return To The Canadian West. I really enjoyed it, and as I became involved in the story, I spent more time everyday reading it. As this book starts, Elizabeth Thatcher has just returned home after a year teaching school in the Canadian west. She has just found out that Jack Thornton has feelings for her, and she is adjusting to how different her home in Toronto is compared to her life in the west. She's not even unpacked when she realizes that her parents have planned a cruise for all the women in the family, along with the wife and daughter of Mr. Thatcher's business partner. Unsure if she wants to go, she has the chance to talk to Jack Thornton, whom she calls Jarrick, and he encourages her to go. I felt as if I was on the cruise with them, and it was interesting to see how she and her mother and sister became better acquainted with each other on this trip. Her younger sister Julie, growing up in a time of real social change, is eager to embrace it all, and finds herself with friends outside of their social circle. This leads to quite a bit of tension, and the climax of the story involves a kidnapping for ransom! We also see Beth's relationship with Jarrick grew through letters and a few phone calls. I enjoy many different authors, and genre of reading, but I know that with Jeanette Oke, and her daughter, I am going to get a story involving people who put their trust in the Lord, even in very difficult circumstances. I received this book to review, but was not compensated in anyway. My thoughts about this book are my own. I had not read the first book in this series before reading this one, but within minutes of starting 'Where Trust Lies,' I knew I'd be picking up the first book in the series to read, as well. I LOVE the Canadian West Series. Is this like a prequel? Like when Elizabeth was young? Janette Oak is a new author to me and it's always nice to have good book recommend. Nice review Deanna. Someday I need to settle into her books. I've read a couple. I'm not crazy about series books because invariably you can never find the one you need next or before, on the library shelves. I prefer a stand alone book. I love it when people recommend books and I learn of new authors...thank you so much for the review....love the bookcover too! Glad that you enjoyed the book. It's always ever so much better to be able to give a positive review. A beautiful book! Enjoy your day dear friend, HUGS! They have made this book series into a great show on tv. We love it. It's actually filmed in Canada. It's called "When Calls The Heart", on the Hallmark Channel. The second season starts this spring.